I find this among the most compelling examples of evidence for “intelligent design.” Try to imagine the countless evolutionary factors that would have to crystallize simultaneously and with perfect synchronization to bring such a phenomenon into existence. A parasitic wasp has been found to ‘drug’ its spider host, inducing it to weave a special cocoon-like structure for the wasp’s own ends. A report in the journal Nature [July 2001] describes how the female Hymenoepimecis wasp attacks the Plesiometa argyra spider at the hub of its orb, stings it into temporary paralysis and lays an egg on the spider’s abdomen which hatches into a larvae that grows by sucking the spider’s fluids. “On the night that it will kill its host, the larva induces the spider to build a cocoon web, molts, kills and consumes the spider, and then spins its pupal cocoon hanging by a line form the cocoon web,” writes William G. Eberhard, of the Smithsonian Tropical Research Institute. The cocoon web results from repetition of certain early stage orb weaving components, and repression of others [to] provide a stronger, more durable protection for the wasp pupae. 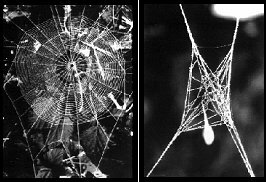 Eberhard investigated the activity and found that even when the larva is removed shortly before construction of the cocoon web would normally start, the spider was still put off course. He concludes that the mechanism employed by the larva to manipulate the spider’s behavior is manipulated by chemical rather than physical interference from the parasite. Many parasites manipulate their host’s behavior, but most of them induce only simple changes, such as movement from one habitat to another, eating more or less, or sleeping. Hymenopimecis’ manipulation of its spider host, [Eberhard ] says, is probably the most finely directed alteration of behavior ever attributed to an insect parasitoid. JudaismOnline sees this as an allegory for the battle between the yeitzer hara and the yeitzer tov — our inclinations for good and for evil. Residing within each one of us is an ever-lurking attraction to material self-indulgence that perpetually tries to lead us into spiritual self-destruction by drugging our spiritual conscience and awareness into senselessness. This entry was posted on August 18, 2008, 11:08 pm and is filed under Science and Nature. You can follow any responses to this entry through RSS 2.0. You can leave a response, or trackback from your own site.